I would like to share with you really spring card. 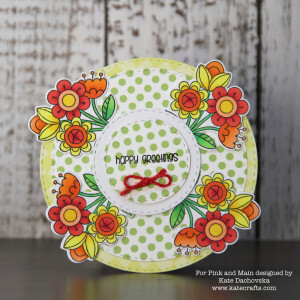 I made shaped card with Stitched circle dies. For background I used papers from paper pad Shades of springand Beach babe. Main images are from newest stamp set – Pocket of sunshine- I stamped flowers with Memento ink and coloured with Copics, then I used Pocket of sunshine diesand I die cut them. It is simple layered card and I really love those spring colours. After such long winter it is so nice.